A selection of tables, guides, and schedules that we hope will provide you with information not found in the more contemporary cruising / navigation guides you are used to. 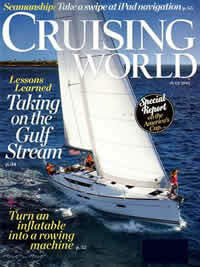 What we hope you will find in these pages is the information you will need to assist you in planning your next voyage. You know, the part about actually getting there. What you won’t find is glitzy photographs, the amenities available at the local marinas, or which restaurant serves the coldest beer. Not saying that cold beer isn’t important mind you, but that’s not our aim here. Hell, what good is cruising without a little sense of adventure and discovery. A discussion on the route, charts, aids to navigation, distances & mileages, communications, and bridges & locks with their schedules, and restrictions along the AICW from Norfolk, VA to Miami, FL and then onto Key West. This information is believed to be accurate as of January 2019. File Size - 27 Kb. This section discusses the route, aids to navigation, distances & mileages, communications, tides, inlets, and bridges & locks with their schedules, and restrictions along the GICW from its intersection with the Okeechobee Waterway at Fort Myers, FL west to Brownsville, TX. 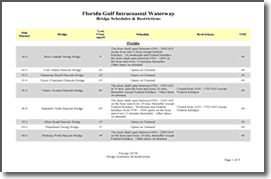 A discussion on the routes, charts, aids to navigation, distances & mileages, communications, water depths, and bridges & locks with their schedules, and restrictions along the OWW from its intersection with the Atlantic Intracoastal Waterway in Stuart, FL to the Florida Gulf Intracoastal Waterway just west of Fort Myers, FL. Transit and navigation information for the NJICW from its northern most point at Manasquan Inlet to its southern terminus at the Delaware Bay at Cape May, NJ. 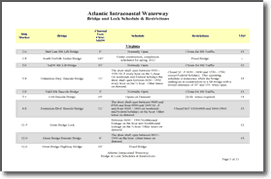 Included are: Bridge clearances, channel depths, currents, and charts, for the 118 miles that make up the New Jersey Intracoastal Waterway. The NJICW is typically open for navigation year round. 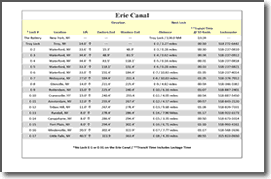 Transit and navigation information on the major canals (Erie, Champlain, Oswego, and Cayuga-Seneca) that make up the New York State Canal System. Included are: Lock information, distances, bridge clearances, channel depths, transit times, and costs, for the 524 miles, 57 locks, and 16 lift bridges that make up the NYSCS. Also included is information on the Federal Lock at Troy, NY. 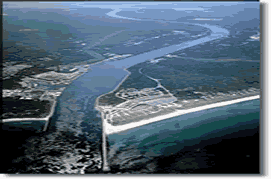 The NYSCS is typically open for navigation from May through October or November of each year. Transit and navigation information for the Richelieu - Chambly - St. Ours canals. 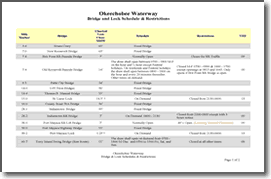 Included are: Lock information, distances, bridge clearances, channel depths, transit times, and costs, for the 68 nautical miles and 10 locks that make up the Richelieu - Chambly passage. The Richelieu - Chambly is typically open for navigation from mid-May through mid-October of each year and offers the boater an alternative passage into and out of the Great Lakes via the St. Lawrence River. 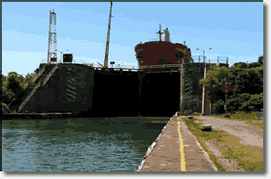 The Welland Canal is a ship canal available to pleasure boats upbound or downbound from Lake Erie to Lake Ontario. It runs approximately 27 miles (42 km) from Port Colborne, Ontario on Lake Erie to Port Weller, Ontario on Lake Ontario. The canal's Lake Erie (southern) terminus, at Port Colborne, is 326.5 feet (99.5 m) higher in elevation than the Lake Ontario (northern) terminus at Port Weller. The canal is comprised of eight locks, taking vessels an average of 11 hours to traverse the canal's length. In the interest of safety, craft of less than 6 m (20 feet) in length or 900 kg (1 ton) in weight are not permitted to transit through the Seaway locks. 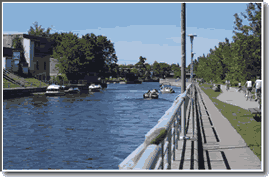 Pleasure craft operators are reminded that the Seaway is primarily a commercial navigation route and that they should expect delays of varying length caused by the demands of commercial navigation at the locks. 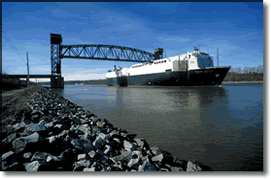 Navigation and passage information for the Cape Cod Canal. Including: Distances, bridge clearances, channel depths, speeds, and transit times. The CCC is a 15.8 nautical mile sea level passage between Cape Cod Bay to the east and Buzzards Bay to the west. The Cape Cod Canal is typically open for navigation year around and provides the mariner with a time saving shortcut when heading north or south along the New England coast. 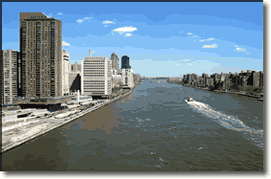 A tidal strait rather than a river, the East River is 14 nautical mile passage connecting New York Bay with Long Island Sound while carrying you through the heart of New York City. Among some of its most endearing features are: Strong current flows, large commercial marine traffic, heavy volumes of recreational boaters during the summer months, the occasional security zone (in the vicinity of the United Nations), and of course you get an up close and personal view of the infamous "Hell Gate." Navigation and passage information for the C & D Canal. Including: Distances, bridge clearances, channel depths, speeds, and transit times. The C & D Canal is a 15.3 nautical mile sea level canal between Reedy Point, DE to the east and the Elk River, MD (Upper Chesapeake Bay) to the west. The Chesapeake and Delaware Canal is typically open for navigation year around and provides a time saving shortcut when bound for Baltimore, Philadelphia, the Delaware Capes, or the Upper Chesapeake Bay. From the Great Lakes to the Bahamas and Cuba and west to Brownsville, TX; The Waterway Guide has you covered. Mile-by-mile navigation information, aerial photography with marked routes, marina listings and locator charts, anchorage information. If you are cruising America's Waterway’s; This is your Bible. The thrill of the open seas. The exhilaration and rush of the wind and water powering you towards your next port of call. Cruising World is dedicated to the traveler who chooses to sail the ocean, looking for adventure and enlightenment. Reviews of trips and destinations, coupled with breathtaking photography make this a great guide for the cruising traveler. Cuba Bound - The North Coast: Ports of Entry and Anchorages is the result of 15 years of travel, sailing and exploration of Cuba's coasts and interior. Published in January 2017 by Waterway Guide, the book provides in depth information and details for boaters headed to Cuba from the United States and Bahamas. Filled with NV Atlas chartlets, selected waypoints, detailed navigation advice and photos, Cuba Bound is a must-have guide for boaters headed to Cuba.